Has anyone else had problems with the integrity of their Pinebook? I look after mine like the fate of the world depends on it, yet I have noticed a crack in the keyboard part of the case. It goes from the top of the power button to near the top of the right hand screen pivot. (01-25-2019, 05:32 PM)ImmortanJoe Wrote: Has anyone else had problems with the integrity of their Pinebook? I look after mine like the fate of the world depends on it, yet I have noticed a crack in the keyboard part of the case. It goes from the top of the power button to near the top of the right hand screen pivot. Yep. 11". It's now like a big "y" shape with a small joined triangle of cracks in the middle too. I'm thinking I'll need to strip it and do some repairs too. While very small, there is a definite gap in the cracks now, so they are widening as well as lengthening and propagating. 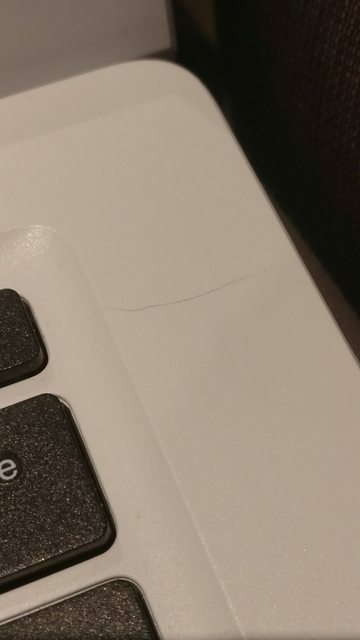 I've got the 14" and I just noticed while using it yesterday that there's a hairline crack between the keyboard and the right-hand side. I've tried to be as careful as possible. Odd. I know I replied to this. I stripped my Pinebook enough to get to the cast in lugs on the affected side. The plastic was in poor shape. Gusseting was cracked, some plastic separated totally and one of the lugs totally adrift. Unfortunately I made a bit of a mess with the superglue, but it did hold things in place. Then I carefully pushed kneadable epoxy into the voids around the lugs. I was careful to ensure everything still had clearance. There hasn't been any movement since. I did learn something from the disassembly. Check the torque of the screws on the underside of the notebook. Especially the two rear side ones as they are also two of the hinge screws, and the only two effectively able to brace against the forces exerted by the hinges when closing the notebook. My Pinebook's screws were loose. This may have contributed to the cracking. Was your case crack similar to this? Seemed to be alright at first but has now begun to spread. Mine comes from the top centre of the power button and propagates to near the op of the hinge cutout, and also about 1/3 of the way up it also goes up and right, with a third crack in the 'Y' joining the two sides together part way up forming a small triangle. I reported the problem as issue #3355, but there has been no reply, yet. My question: What plastic is the shell made of, and what would be the most suitable glue - super-glue, epoxy, solvent-based? Observe from photo, this is the hinge connection place, and seems like they is a force impact on hinge area and casing this damage.